“I don’t know when the time is going to be to actually buy it. I think overall growth tech will have to stabilize. But I’m very interested in this one,” she said. Elsewhere in the space Link is watching Xilinx, and is waiting for a pullback to buy the stock. “Xilinx had a wonderful quarter and that stock has held up quite well,” she said. But not everyone believes that Nvidia’s pullback is overdone. Virtus Investment Partners’ Joe Terranova is staying away from the stock for now. 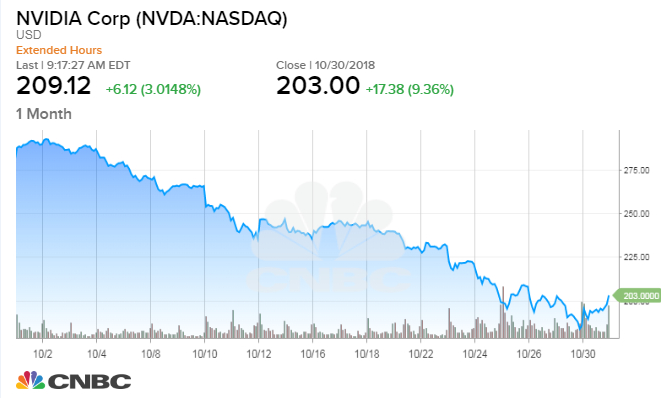 “Nvidia is in free-fall…Why are you buying that near-term free-fall when you could buy a quality company like an Intel and play the same type of bounce…I think the market is more comfortable buying an Intel than it is taking a chance that AMD or Nvidia is going to experience some sort of a bounce,” he said. Shares of Nvidia rose 9.36% on Tuesday, the company’s best day since May 2017.